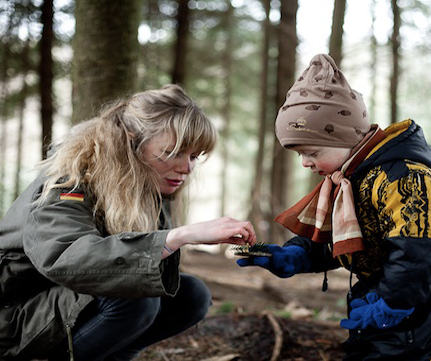 A Forest School course (6 sessions) – ‘Squirrels Group’ for ages 2.5-5 yrs! Every Thursday in Term Time only. Explore, discover, create and make friends at our lovely Thursday Forest School group. Our unique Forest school session is led by Lucy from Lucy’s forest school. I have always worked with children and loved the outdoors, after spending 10 years working at Montessori pre-schools in the UK and in Thailand, I feel so lucky I get to spend my days in the wood, lighting fires and being creative with children as well as learning together. It’s a nurturing, fun, creative space for children to learn, develop, grow in confidence and have lots of memorable first experiences with their grown-ups. With lots of opportunities to explore, experiment and be part of a team , children and adults learn about the woods, wildlife, the seasons, themselves and each other. Autumn is a magical time in the wood so come and explore with us…. 6 sessions for £45.00, running term time only. Baby siblings free and more than welcome!